Microsoft is back to some of its old antics in the Windows 10 October 2018 Update. 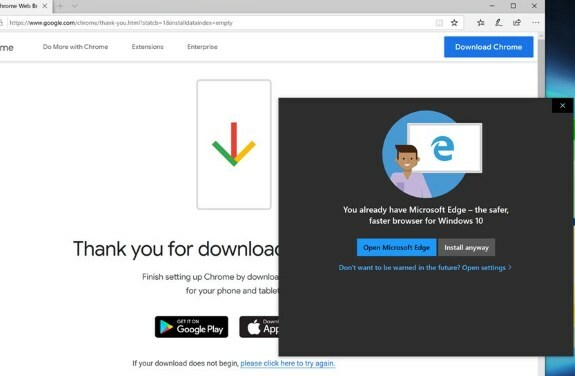 ExtremeTech notes that when users that try to install an alternative browser like Chrome or Firefox, Windows 10 will display a warning screen that tries to persuade you not to dump the built-in Edge browser. The language is very suggestive and claims Edge is the "safer, faster browser for Windows 10." There is absolutely no justification for this. Chrome is not malware. There is no valid reason for Microsoft to be warning me about a Chrome download, and the use of the word “warning” is Redmond’s language, not mine.